Going on vacation means you can leave many of your daily duties behind unless, of course, you are a parent. Kids need attention whether at home or away at a vacation destination. 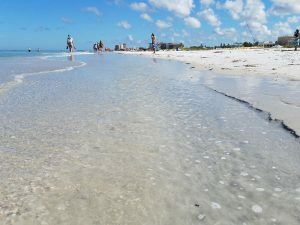 We thought we would help you out with some info on places kids can play at Clearwater Beach. We will lay out the most obvious thought first. Clearwater Beach has a beach. If you did nothing other than walk your kids down to the shore ever day, you would probably succeed at giving them the best vacation they’ve ever had. The beach is hours of fun and at the end of it, kids are usually ready to sleep. If you were lucky enough to have beach vacations as a kid, you will probably remember those days as hazy, wonderful memories that were your favorites. When the naps have recharged the batteries and its evening, it might be time for a different kind of activity. Or, with all the things to do at the beach, the kids will surely solicit you to take them to some of them. You will probably spend a vacation day or two exploring the other parts of the beach. Here are some other things kids to do. On the south end of Clearwater Beach you will find Captain Bligh’s Landing miniature golf. It’s a fun, pirate themed, putt-putt course with lots of water and other interesting obstacles to keep it fun. It has a fair-sized parking lot (for the beach) behind it, or you can walk there, which usually the way people arrive. Be warned parents, there’s ice cream along the way. Also on the south end of Clearwater Beach, facing the white sands of the shore, you will find the giant gift shop called Surf Style. Be aware that Surf Style has three locations on the beach, and presumably does well with each one. The one we are referring to is next door to the Hyatt Regency and opens onto the wide sidewalks known as Beach Walk. Inside you will find, well, everything. It’s a great place to shop for beach wear, beach toys, accessories, munchies, beer, and plenty more. Also inside you will find FlowRider, an indoor wave surfing machine. This indoor water machine shoots water up a slide that you can surf or boogey board. It’s lots of fun to do or even just watch. As you can imagine, kids love it. If you have a thrill-seeking child, FlowRider will definitely make that one happy. On the north end of the beach, you will find a shop called The Hub. At first glance, you might think it’s an Internet café. It’s not. Inside you will find the coolest virtual reality games not only on the beach but in the region. 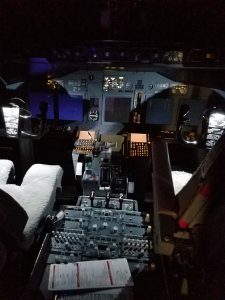 Fly planes, go into space, and experience a few other cool games in this unique fun-shop. You will find The Hub upstairs at Pelican Plaza that also houses Brown Boxer pub and Hulk Hogan’s gift shop. If you have a gamer in the family, that one will love The Hub. Simple fun can sometimes be the best. The next fun stopover is the most time-honored. 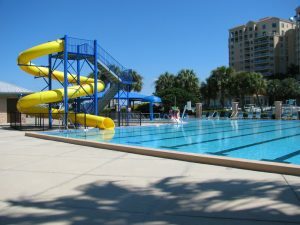 Clearwater Beach has a number of playgrounds and playing fields. On the north end of the beach, across from the Beachfyre Grill is a large playing field with adjacent playground equipment. It has a set up for baseball, although we’ve never seen a game being played. Additionally, a horseshoe pit runs next to the sidewalk. A second play area can be found on the north end of the beach at the Clearwater Beach Rec Center. It has basketball courts, tennis courts, and a pool with a giant slide and waterpark fountains. The pool is only open during the summer months. The third playground is at Pier 60. It has a nice sandy play area which is the natural sand of the island. The Pier 60 playground has more play equipment than any other on the island and includes shade structures. We have saved the best for last and it is Pier 60. We are telling you about it here, but we probably don’t have to. If your children catch sight of it, they will insist that you take them there. Pier 60 has a playground mentioned above but a whole lot more. A concession stand serves beach style food but the real eye-catching play things are out on the sand of the beach. 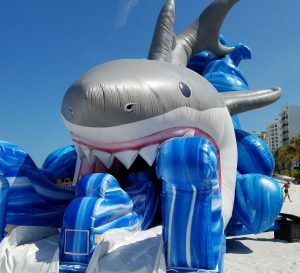 Giant inflatable slides brighten up the waterfront along with a bounce house. Next to them, at the corner of the pier itself, is a bungee ride that kids of all ages love. Pier 60 is hosts the Nightly Sunset Festival. Don’t let your kids miss it. It has lots of trinkets for sale but it also has artists and performers to thrill your kids. Face painting, hair braiding, caricatures drawings, kid tattoos and more are available, depending on which artists arrive at the festival that evening. The performers gain the most attention when they start up their shows. Catch shows from fire breathers, escape artists, knife jugglers, whip crackers, acrobats, and magicians. The Pier 60 Nightly Sunset Festival runs every night but the best nights to attend are Friday and Saturday. With that, you have your line up of places for kids to play and enjoy themselves on Clearwater Beach. With the beach and all the other things to do, as a parent, you will have no trouble keeping your children entertained.